Want to find the perfect Emerson thermostat? 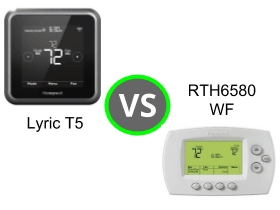 Let’s face it- you are spoilt for choice from one of the largest manufacturers of thermostats in North America. Emerson make a huge variety of different thermostats to suit every home. In this article, I will explore three different types of Emerson thermostats. But, before that, let’s briefly look at the history of Emerson. The story behind Emerson thermostats is a fascinating one. Emerson are a huge multinational engineering and electronics company who specialise in far more than just thermostats. Athough they were founded in 1890, it wasn’t until the 1960’s that the company began making thermostats as they bought a company called White Rodgers. But enough of the history lesson, let’s move on. At this point I am thinking on the company level and not about individual models of thermostats. Most thermostats come with a one year warranty, whereas Emerson offer three years. The ST55 won “Best Value Smart Thermostat 2017” by reviewed.com. And in this 2017 customer satisfaction survey, Emerson thermostats came second behind Nest. *Even Emerson thermostats that have cutting edge performance, do not have cutting edge “good looks”. They are built to perform exceptionally: they are not designed to win beauty competitions! Part of the challenge of finding the right Emerson thermostat is that their range of products is so vast. One of the reasons for this is that even identical thermostats are given different model numbers. Emerson makes a huge range of thermostats. A factor that can add to the confusion is that many of the company’s thermostats come in two variations- DIY or Pro. The only real difference between a DIY or Pro version of a thermostat is the warranties that are offered on them. A DIY version of a thermostat comes with a three year warranty, whereas a Pro version comes with a five year warranty. 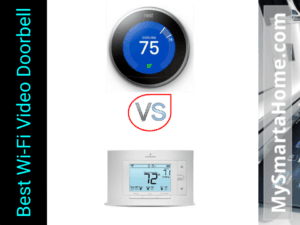 In terms of looks and functionality a DIY or Pro version of any thermostat are identical. But, in order to qualify for the extended warranty, the thermostat must be installed by an HVAC Pro and you need proof! Without this proof even Pro versions only have a three year warranty. The issue here is that identical thermostats are given totally different model numbers depending on whether it is a DIY or Pro version. The Emerson Sensi WiFi Thermostat is a HomeKit enabled smart thermostat. A non programmable thermostat is the simplest of thermostats because that’s all it is- a thermostat. It provides you with the ability to control the temperature of a room or house. The only way to change the temperature is by pressing the buttons on the front to increase the temperature or decrease it. Non programmable thermostats are not very common nowadays but you can still easily buy one. I think that there are two main groups of people who should use non programmable thermostats. People who spend a lot of time at home, indoors. People who value simplicity and price over flexibility and convenience. A programmable thermostat allows you to control the temperature of your home at specific times of the day without having to press a button on the front of the thermostat every time. This allows your HVAC system to be turned off when the house is empty or at night in order to save energy and costs. But, do you want to know a scary fact? This survey found that a staggering 40% of people who had programmable thermostats did not use the programming features and this survey found that nearly 90% of Americans confessed to rarely programming their thermostats! Huge numbers of us are using our programmable thermostats as if they were non programmable! But they will also allow a user to group days together. So for instance, with your programmable thermostat, you might set up a schedule for a Monday and then decide that you want the same schedule for Tuesdays, Wednesday, Thursday and Friday. Equally, you might set up a schedule for a Saturday and want to copy it for a Sunday. Most thermostats that are bought nowadays are programmable ones. Smart, connected or wi-fi thermostats are all examples of ”super powered” programmable thermostats but it is important to remember that a thermostat does not need to be smart to be programmable. Programmable thermostats do not need to be connected to the Internet, a smart hub or be controlled by an app. 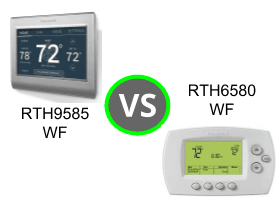 The best Emerson programmable thermostats have built in “schedules”, so that you do not even need to create your own. Earlier I described smart or wi-fi thermostats as super powered programmable thermostats. The main difference between a smart thermostat and a programmable thermostat is that a smart thermostat connects to the Internet. And it is that connection that unleashes the magic. In much the same way that eating spinach gives “Popeye” the sailor man special powers, the Internet gives wi-fi thermostats an extra boost! By downloading an app onto your smart phone, tablet or by creating a free Sensi account online, you don’t need to stand next to your thermostat in order to control it. As long as your phone and thermostat are connected to the Internet, you can control your Sensi thermostat from anywhere in the world. This is the ability to track the location of your smart phone and then to use it to turn your HVAC system on or off. With Sensi smart thermostats, your system is turned off when you are three miles away from home and it is turned back on when you are within 3 miles of home. To find out more about how Sensi’s geofencing works, read this. 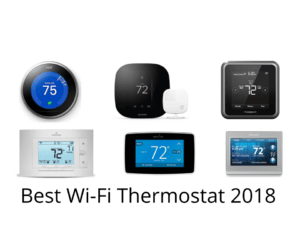 The third and final feature that Emerson wi-fi thermostats have, that Emerson programmable thermostats don’t are home automation compatibilities. Home automation are the systems that run smart homes. Smart homes are homes that contain smart devices, which are devices that can be connected to the Internet and each other. 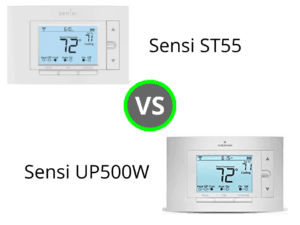 Sensi thermostats can work with a few smart home systems. This is Amazon’s voice controlled system which uses their interactive Echo speakers as hubs. A growing number of smart devices can be controlled using your voice and these include Emerson’s Sensi thermostats. Linking your thermostat and your Echo device is quite easy and step by step instructions can be found here. Wink system is one of the largest smart home systems in terms of the number of devices that are compatible with it and the number of people who use it. In order to use it you need to have or buy a Wink hub. To find out how to connect your Sensi thermostat to your Wink hub, read these instructions. Apple HomeKit is a voice control smart home system built using the power of Siri and devices such as the iPhone. There are two Sensi thermostats that work with HomeKit and they are the ST55 and the ST75. This is Google’s voice controlled smart home system. Like Alexa, it uses a few different interactive speakers (Google Home) that can connect with different smart home devices. Google Assistant does not work directly with any Emerson smart thermostats. It can only be used via the Wink system, described above. However, to find out more about using Google Home with your thermostat, visit this page. Emerson’s range of smart wi-fi thermostats is called “Sensi”. There are three basic models in it- although these models have separate “Pro” and “DIY” versions of the thermostats. In this comparison, I explain that the ST55 and the UP500W are almost identical. In fact to look at them it would be hard to tell the difference. And the difference is that the ST55 will work in an Apple smart home system (HomeKit) and the UP500W won’t. The ST75 looks completely different though. It has a colored touch screen (that the ST55 and UP500W don’t have) but it has pretty much the same functions as the ST55 and UP500W. The Sensi Smart ST75 is a modern thermostat for a smart home owner. It is a perfect thermostat for those people who want to be able to control and manage their thermostat remotely and add the ST75 to their smart home system.